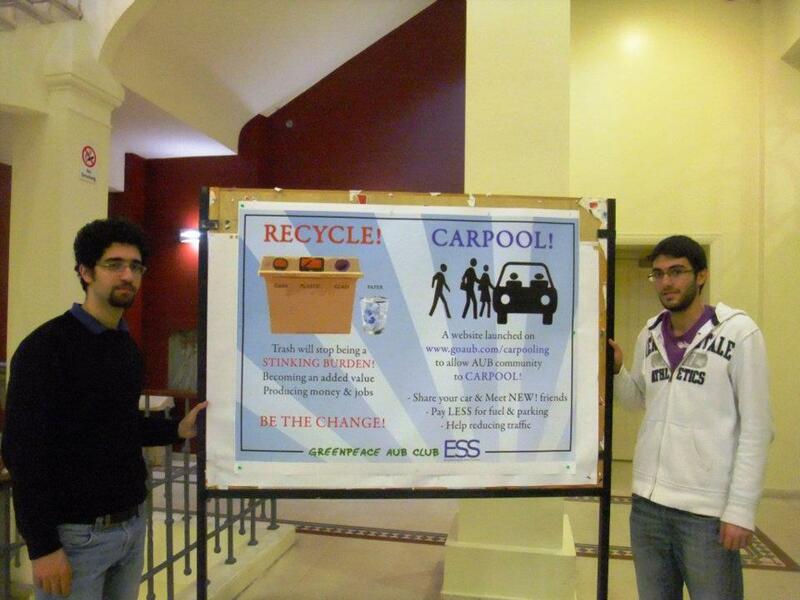 The AUB Carpooling activity allows students, faculty and staff the ability to conserve energy while making new friends. Stuck in traffic jams and not finding a parking space? Paying a lot for fuel and parking? Bored of driving alone to and from AUB? Tired of coming and leaving by taxi? Carpooling is what you need! Erik Zakhia, a third year mechanical engineering student and president of the Greenpeace AUB Club, which is independent from the national branch of the global environmental NGO, came up with the idea when he saw that the faculty of engineers at the University of Saint Joseph were trying a similar thing, on a smaller scale. Working with the founder of goaub.com, an online portal for students, Zakhia created a system whereby the AUB community can log in securely, either to offer to be a driver, or to look for rides. Users can view a Google map of available rides that day, and contact the driver through the site to ask for a lift, or arrange journeys. I urge my AUB readers to try out this service by signing up to the website. All you have to do is "become a driver", if you have a car and usually come to AUB with it, and then add trips. Thanks for your support and passing the word !